I have two rooms in my house that I’ve set up as guest rooms. The first room, the one I’m featuring in this post, is the more finished of the two for now. I felt like going with a slightly french country chic look in this room, especially after I found some wonderful fabrics. 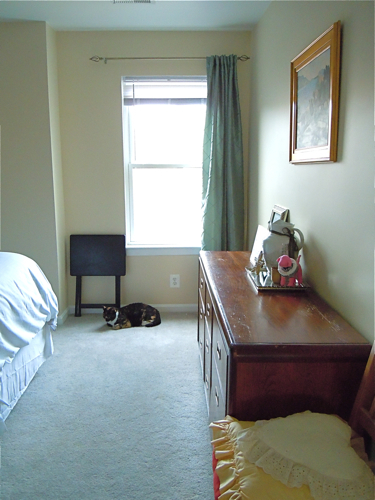 First, a look at the dull, bland room before. 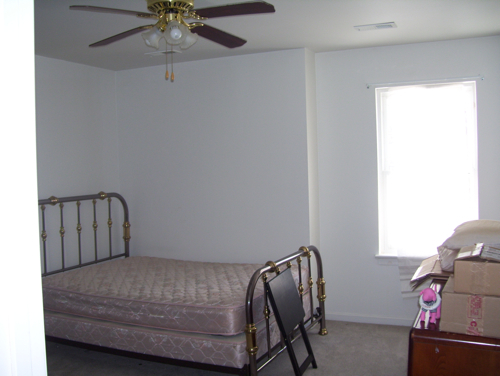 When we purchased our house, none of the rooms were actually painted. There was a basic primer over everything, and that’s it. 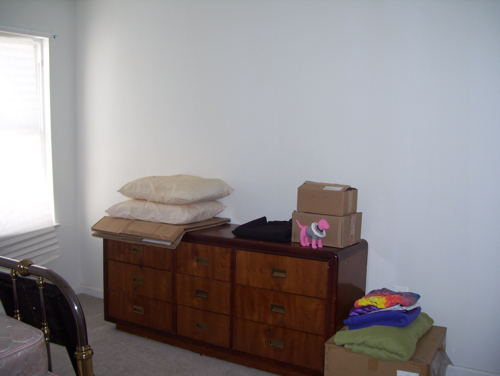 We had purchased some furniture from a newspaper ad for very little money, and threw a few of those pieces in this room. 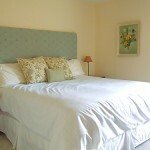 Namely, the bed and dresser. About a year after we moved in, my stepson and his girlfriend moved in for a few months. When they left, they took the bed with them. So now I was left with essentially a blank slate. 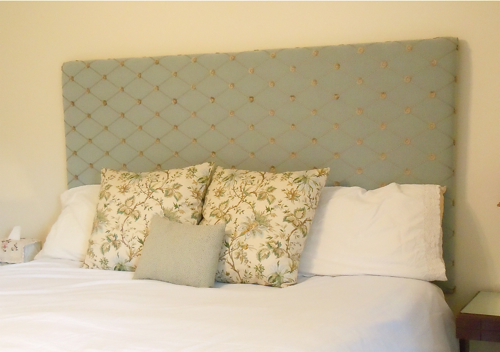 The headboard I upholstered myself (found here), and made the pillows to match. 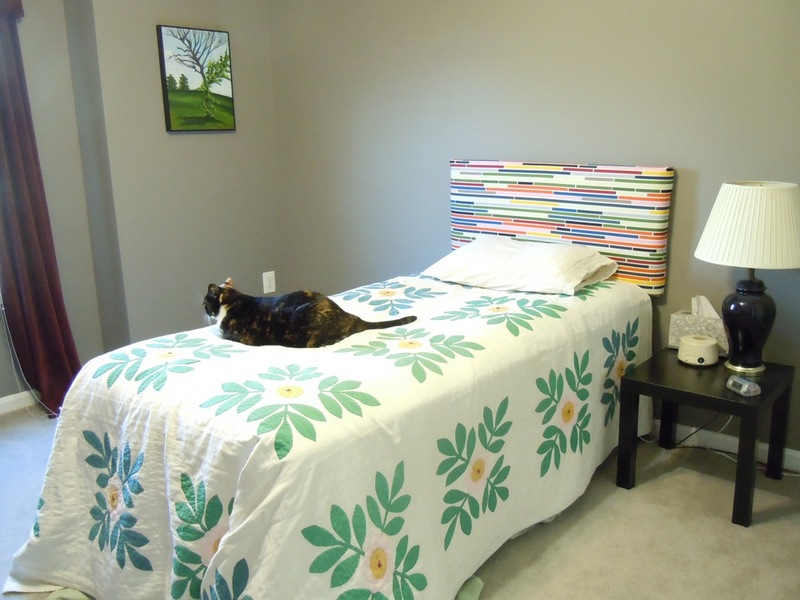 I just went with a simple white comforter cover and bed skirt for now- we had guests coming and I wanted it to look presentable and I did not want to spend very much money on it. (To me, anything over $20 was too much money). The painting on the wall was a ‘thrift’ store find for less than $25. I did a quick dry brush of white paint over the frame to spiffy it up a little. I’m still trying to decide what sort of lamps I want (I’m leaning towards mounted wall lamps), and I still need to refinish the side tables. 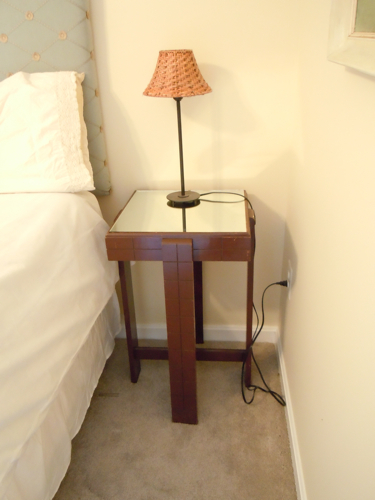 These side tables are another freebie from the studio. I was told they originally had blue glass tops (how neat!) but they are unlocated at present. Originally I had hoped to put some sort of marble tile in there, but they are a whopping 16″ square. Time and money were prohibitive, so I settled on a mirror top. This one is painted brown, so I don’t feel so bad refinishing them. Even though it may not fit the room, I think they’d look best with a dark or black stain. I also considered painting them something bright, like a turquoise color. But, I’m just not feeling it. There’s one window in this room, and for now, one curtain. I found the curtain at Target and loved it- especially since it seemed to mimic the design on the headboard. The dresser stays, for now, even though it’s a poorly constructed 1970s plywood-like special. I do like the pulls though, and might consider doing a two-tone paint job to make it a little more fun. On the dresser I made a little vignette. I framed a picture I took of the interior of the Pantheon, and a photo by Ansel Adams from an old calendar with frames from Michaels. The mirrored tray and pitcher are family pieces handed down. The pink dog was a freebie from Victoria Secret, and I can’t remember where I got the stars and candle. 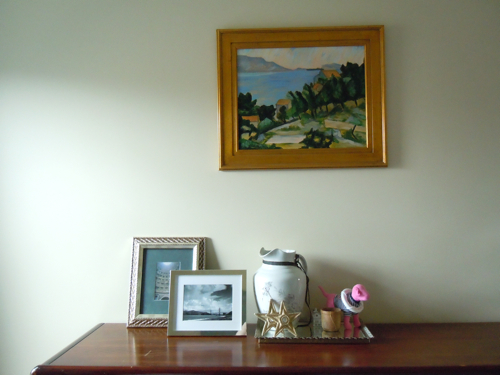 The painting is one I did for my landscape painting course, after Cezanne. The logistics of upholstering a twin sized headboard are exactly the same as a king-sized board, except the size of materials needed. 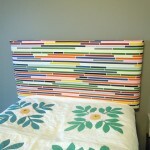 -1 piece of plywood cut to size – for this twin sized headboard, I used the left over piece from the king sized headboard they cut for me at home depot. The dimensions are 48″ wide by 20″ tall. 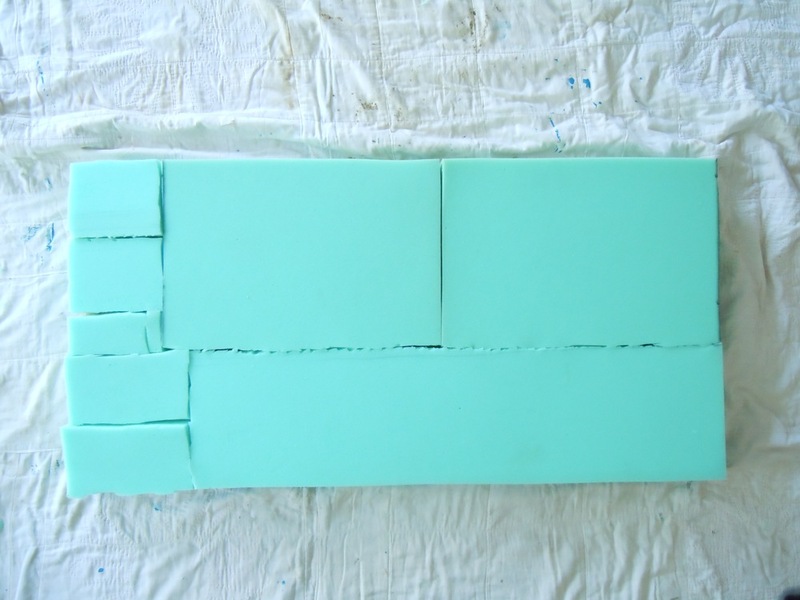 -Foam – I like the feeling and depth of 2″ foam. -Spray Adhesive – to attach the foam to the plywood. -Batting – for this project, I bought one yard of batting. -Fabric – Apx. 1 yard. (If you buy a pattern, be wary of which direction you want the fabric to go and how much you’ll need). 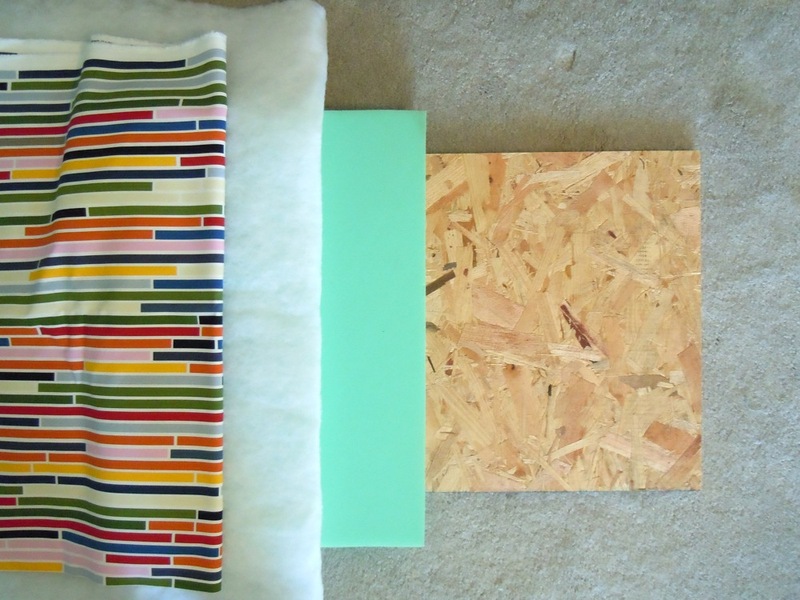 Anatomy of a headboard: (from left to right) Fabric, batting, foam, plywood. 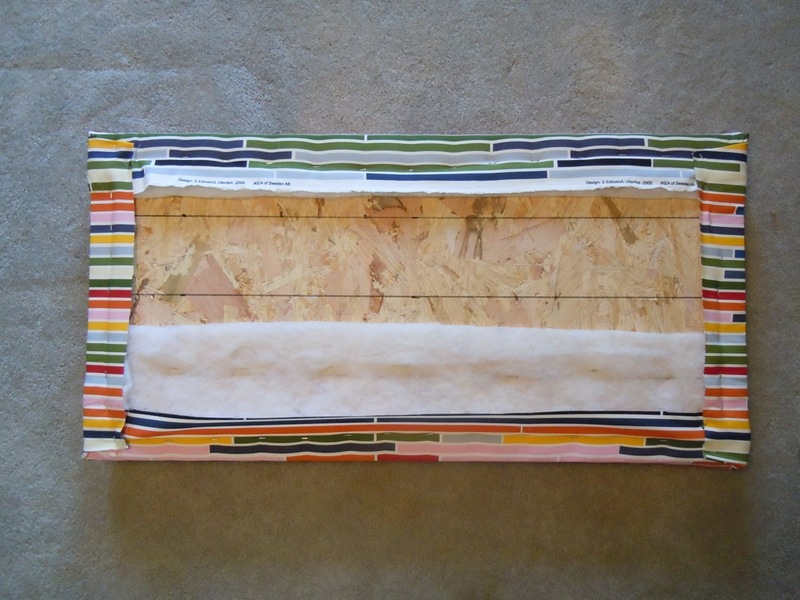 Materials used on an upholstered headboard. 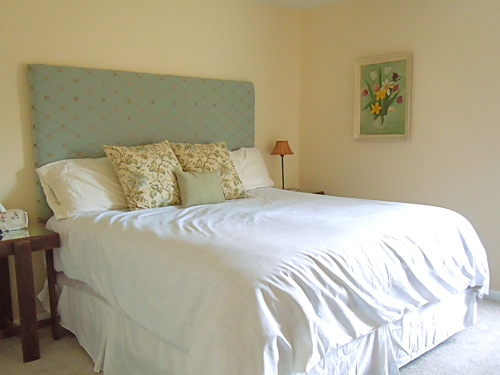 First, mark some measurements on your headboard. I do this for two reasons: 1. the hanging hardware and 2. to act as a guide to keep my pattern in line. You can also do this step after you’ve attached your foam to the front. Plywood face down with markings. 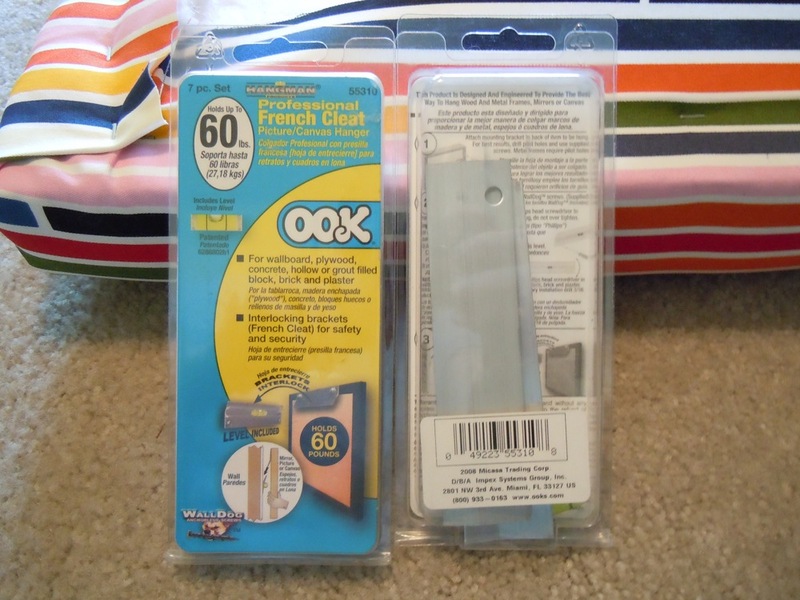 Cut your foam to fit and attach with spray adhesive. I was careful to make sure there weren’t any large gaps, and that the pieces were pretty level with each other. 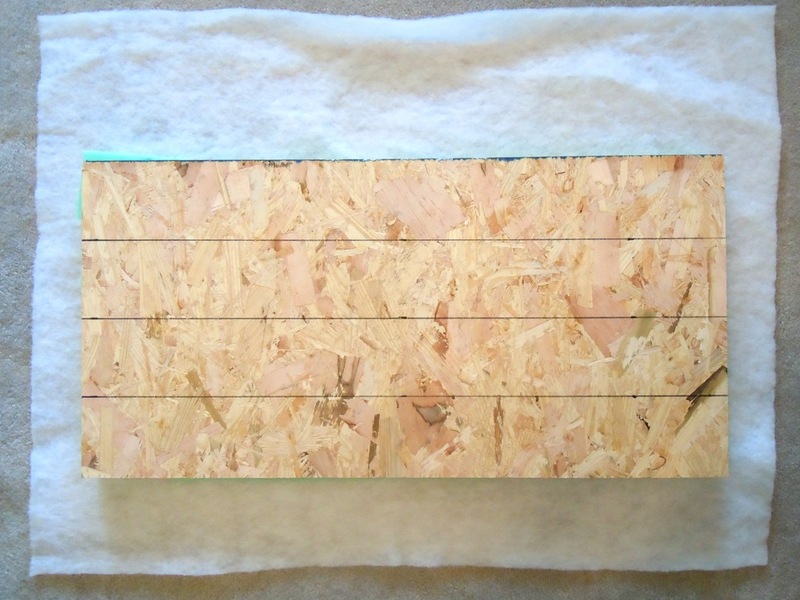 Next, place the plywood foam side down on your batting, and pull gently (but not super taught) and staple. Place your fabric face down, and repeat the previous step. 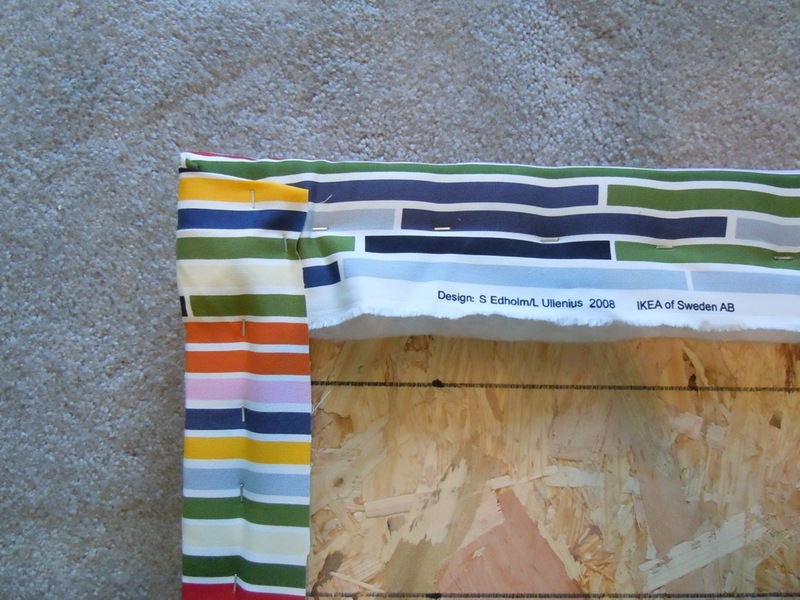 I used the lines on the fabric as markers to keep in line with the marks I made on the back of the plywood. 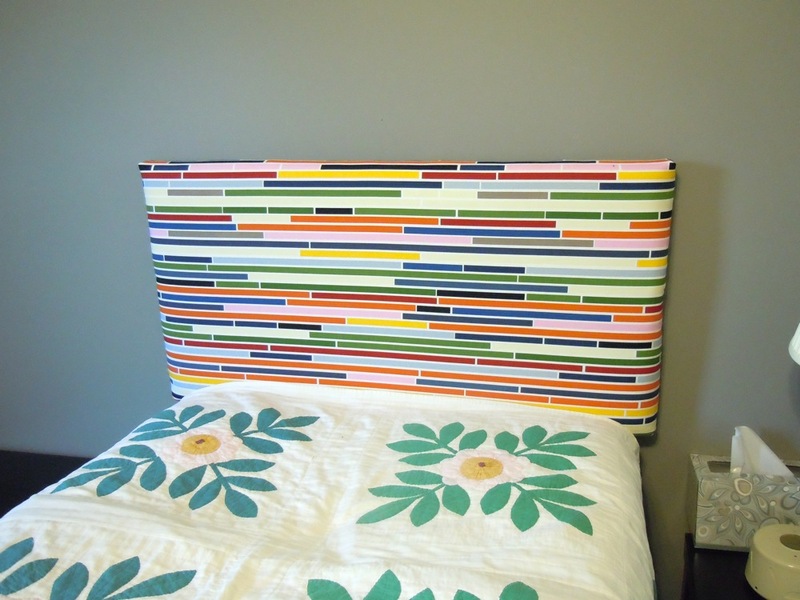 Fabric stapled to the back of the plywood headboard. For the corners, I was careful to pull them taught in one direction, and then fold under to create a neat line. Detail of the back corner stapled. I found this neat, modern fabric at Ikea! It was labeled new and at $7.99 a yard, I couldn’t say no. It’s very thick and sturdy. They even come with their own level! But two of these babies, and that headboard isn’t going anywhere. Peanut loves the updated bed!